Under water stress plants decrease their growth rate, first because of a decrease in their assimilatory surface and, second, because the photosynthetic rate is inhibited (Lawlor and Uprety, 1993). CO2 reaches the carboxilation sites through stomata, the same than water lost, therefore as an attempt to save water under drought conditions, the stomatal closure affects photosynthesis by limiting CO2 availability (Mansfield 1990). 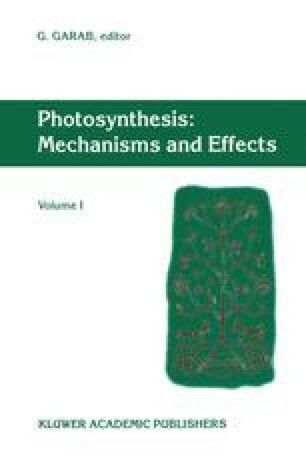 Also, water stress restricts photosynthesis through “non-stomatal” effects, among which PSII and ATP synthase inhibition in thylakoids are thought to be important (Boyer, 1977; Boyer and Younis, 1983). Non-stomatal effects are believed to occur mainly because CO2 shortages would induce an over-excitation of PSII complexes, which in time, and depending on the capacity for absorbed energy dissipation as heat, would induce inhibition of photosynthesis. This water induced inhibition of PSII activity is light dependent, and therefore recognised as photoinhibition.